Alice Canton is an award-winning performer and theatre-artist based in Auckland, New Zealand. Her collective practice, White_mess, is an open structure concerned with developing robust performance practice to create distinct, live performance experiences for audiences, ranging from solos to large-scale community engagement projects, including site-specific activation and improvisation. Alongside her work as a performance-maker, Alice regularly teaches workshops and classes in schools, programmes and institutions. Her work covers theatre-making and design research through storytelling: a dynamic, energizing and inclusive practice that spans across a wide range of abilities and ages. 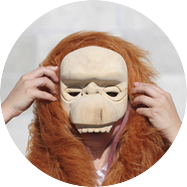 White_mess is a creative, open structure concerned with developing robust performance practice to create distinct, unfamiliar, live encounters for audiences. White_mess is currently based in Tāmaki Makaurau (Auckland), New Zealand.